For better or worse, the French hold top spot when it comes to global romance—in reputation if nothing else. We know, you’re probably not French, but a little Parisian flair never hurts on Valentine's Day. French cuisine gets somewhat of a bad rap for being pricy and exclusive (Italian joints, too, for that matter), but do a bit of research and there some solid, non-wallet-destroying venues out there. 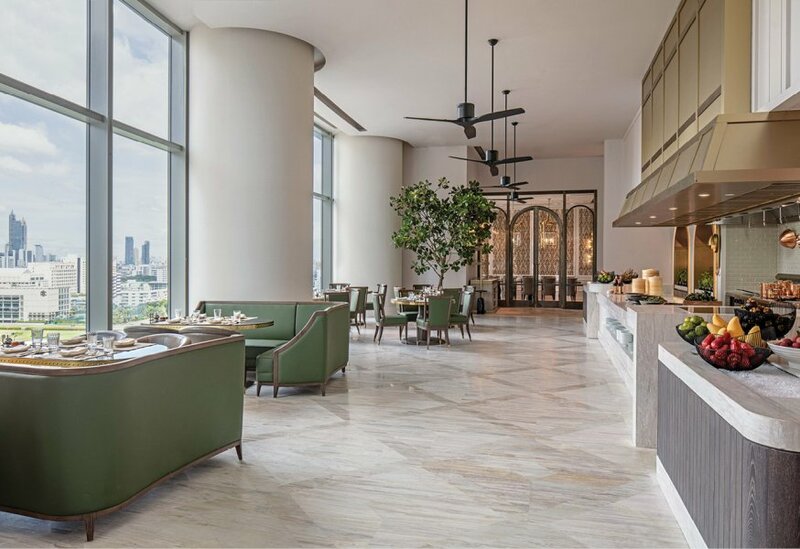 The Waldorf Astoria Bangkok’s The Brasserie, combines the best of the French cooking scene in a pretty approachable, and romantic, environment. The food is all-day French at its best with items like fresh steak tartare and duck confit with purple mashed potatoes in endless supply. Prices start at a very reasonable B350. A Valentine’s Day steal, we must say. We won’t shame you for burning a hole in your wallet this time of year—everyone does it. You definitely don’t need to go all-out money wise this time of year, but for those willing, a once-in-a-blue-moon fine-dining feast is exactly what the doctor ordered. Long tasting menus with exotic ingredients and plenty of chat time between courses with glasses of wine is a combination that pretty much can’t go wrong. Nordic-Thai restaurant Front Room is an outlier here, even among established fine-dining players. After 12 years training in Denmark, Chef Rungthiwa Chummonkol, better known as Chef Fae, has returned home to incorporate Scandinavian cooking techniques with local Thai ingredients in a special nine-course menu (B5,500, including a glass of Champagne) or with an additional of B2,500 for wine pairings. 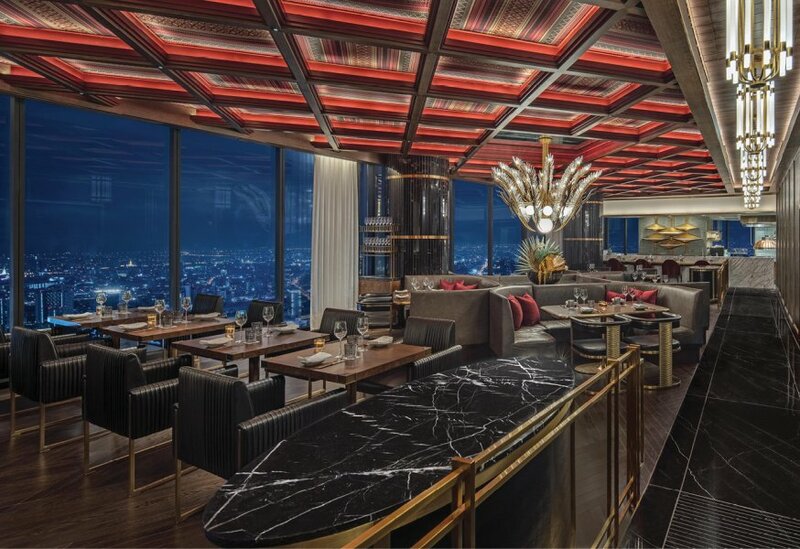 Alternatively, a true meat lover can go to Bull & Bear—a steakhouse with lavish dining spaces on the 55th floor of Waldorf Astoria Bangkok. Here, Chef Patrick Morris mans the grill to sear and sizzle some of the best cuts of meat you can find. You can snag the set-menu for B4,500 per person, or go full a la carte if you want to mix-and-match as you see fit. A little tinge of extra sophistication on Valentine’s Day is fun. Aside from fine-dining and Frenching things up, afternoon tea and treats is about as high-brow as it gets in term of afternoon relaxation. In fact, afternoon tea has a long, long Valentine’s Day tradition—they both come from England. At Peacock Alley, tea devotees can sip their afternoon drink in an elegant lobby. The special Valentine’s afternoon set, available from Feb 9-14, will feature upscale teas from Mariage Freres—accompanied by sweet and savory treats of your choice. All of this at B2,100 for two. Cap off the perfect date with a glass of bubbly. The real food of love is booze—we don’t mean going overboard, folks—and a glass of Champagne (usually in a pricy rooftop setting) is the be-all-end-all of romantic drinking. Waldorf’s The Champagne Bar is filled with big comfortable couches, lamps and glass cabinets with expensive whiskeys on display. There’re four affordable options by the glass—from B680 starting with Charles Collin Blanc de Noirs Brut, NV, up to B1,200 for a glass of Billecart-Salmon Brut Rose, NV. For Valentine’s, couples can shell out B5,500 for a bottle of Billecart-Salmon Champagne and half-dozen oysters while enjoying the breathtaking backdrop of Bangkok skyline.